When your water heater fails to heat up, presents a scalding hazard, or makes loud noises, it may be time to consider replacement. While a routine repair may address some of these problems, it’s common for aging water to show signs of wear and tear or fail to perform efficiently. If your hot water heater is nickel and diming you—or it’s over a decade old—request a no-obligation replacement estimate from Elek’s award-winning Lehigh Valley plumbers. If you’re like most Allentown, Bethlehem, or Easton homeowners, you want to get every bit of life out of your home appliances. Let’s face it: replacing home plumbing equipment is an investment most of us put off—and many of us forget about our water heater until the shower is ice-cold. At Elek Plumbing, our team of licensed SuperSTARS makes your water heater replacement fast and hassle-free. Discolored water. If black or rusty water is coming from your hot water system, your water heater may be rusting out. You may also notice a metallic taste in your water as rust makes its way through the pipes. Before a catastrophic leak occurs, call in a plumbing professional to investigate. Rumbling sounds. Sediment and mineral buildup is inevitable in a storage water heater. However, if the sediment is not removed regularly and it hardens inside the water tank, your water heater will use more energy and make loud noises as it tries to heat up. With excess heat comes more wear and tear, and eventually pinhole leaks may develop. Warm or cold water. When water is not hot enough, it could indicate a failing heating element or a thermostat problem. This is a common issue for old water heaters that need replacing. When it’s time to replace your water-heating appliance, today’s tankless water heaters offer efficiency benefits. Tankless models provide hot water on demand rather than saving it in an insulated tank. They are eco-friendly, space saving, and last up to twice as long as storage water heaters. Tankless units are not for everyone, though—since the upfront cost is significant and they may not keep up with water use in a large household. 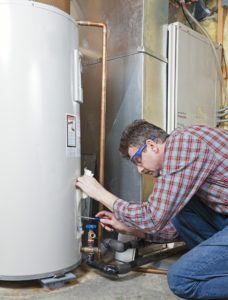 When you request a no-obligation hot water heater replacement estimate, there’s no “hard sell.” Instead, our licensed plumbing team will guide you through the options that suit your budget and comfort objectives so you can make an informed choice. Connect online today—or call 610.432.7001 now!